These beaded tassel earrings are an easy craft project allowing you to DIY one of the cutest trends in jewelry right now! I feel like I've seen tassels on everything these days: clothes, shoes, purses, key chains and especially jewelry. I don't mind it though...I think tassels are adorable! 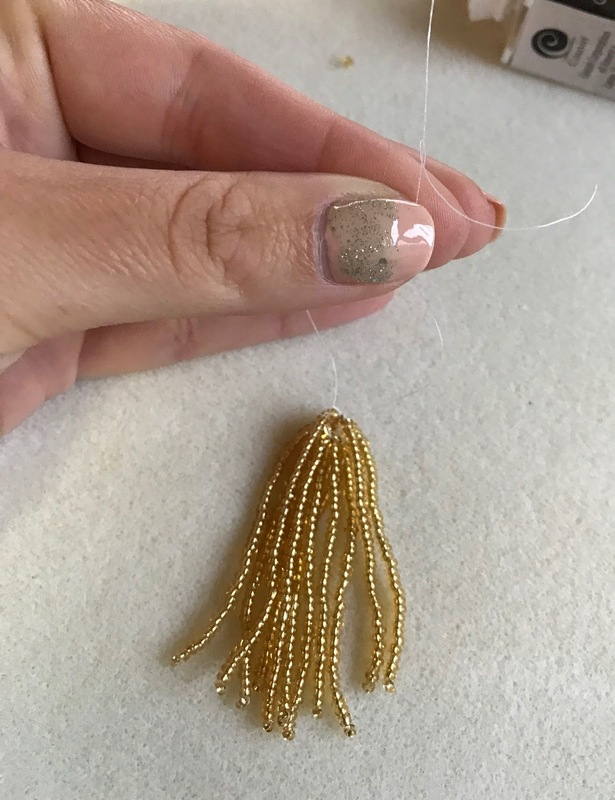 You can make tassels out of various different materials, but being the jewelry maker that I am, I knew I wanted to try a beaded version of this new trend. 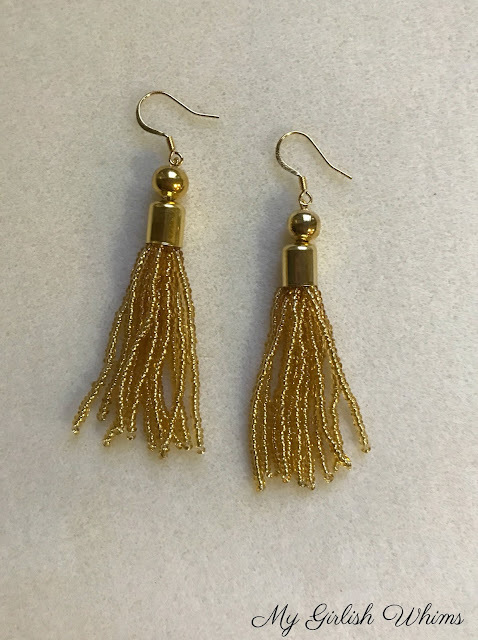 You really don't need a lot of supplies to make these earrings: basically it's just seed beads and a few findings so this is the perfect project to pack up and take with you somewhere. I actually just made these earrings this past weekend when I went down to the beach with my parents! We were hoping for some nice weather for the long labor day weekend...anddddd then it proceeded to rain all day Saturday. Bah! I actually didn't mind the poor weather: I still love going down to the beach even if it's not really beach weather. I got to sneak in a run on the boardwalk Saturday before the rain started, enjoy the views of the ocean, and then had plenty of time to relax at the campground with some good wine and was able to start and finish this project on Saturday while the rain came. 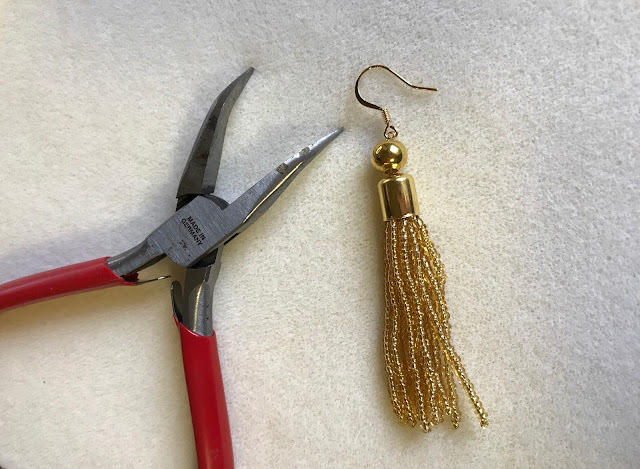 I learned the basics to make these earrings from a tutorial video from All About Beads which I will post in the instruction section. I changed the technique just a little bit, read on below to see how you can make your own version! 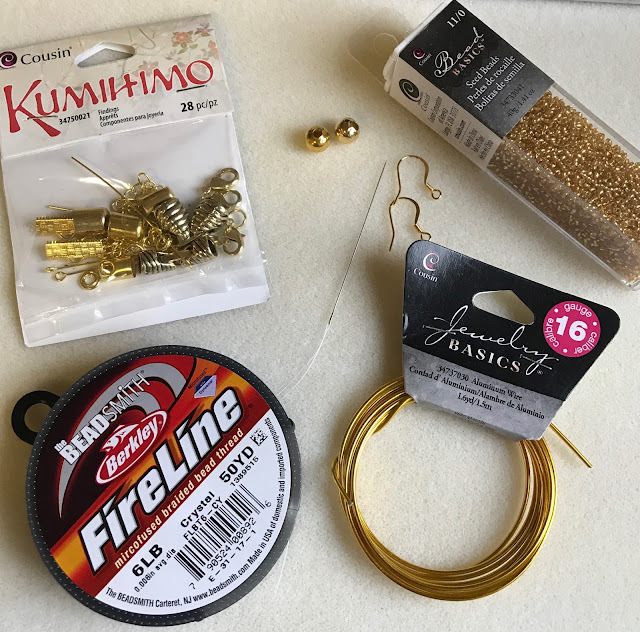 You will need fireline beading thread, a beading needle, two jump rings, two eye pins, two bead caps, two gold beads, two ear wires, and gold seed beads. I didn't end up using the wire that was pictured: and I used the bead caps, eye pins and jump rings included in this finding kit from Cousin Corporation. You will also need needle nose pliers, round nose pliers, wire cutters, and scissors. To see a video instruction of how to make these earrings, check out this YouTube video from All About Beads. I took some photos of my (slightly different) version and will list the instructions below, but that video was super helpful for me when I learned how to make the earrings! First and foremost: cut a very long piece of fireline. I cut about maybe 4ft worth to start. 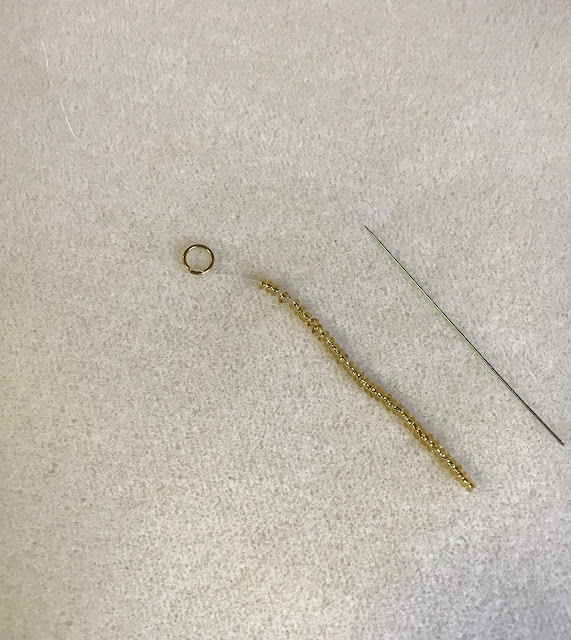 Thread the fireline onto a beading needle, then thread on a 6mm jump ring and then two inches worth of seed beads. 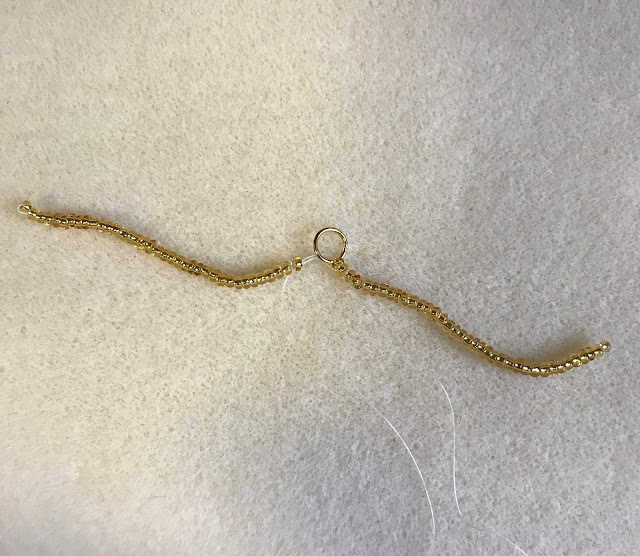 Slide jump ring to the end of the thread leaving just a small tail on the other side and bring the section of beads up close to the jump ring. 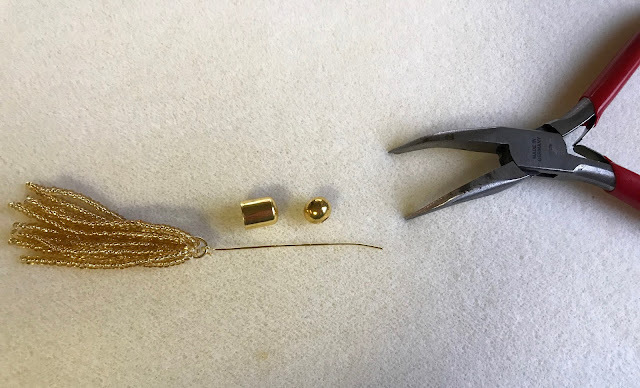 Skip the very last seed bead you added on and then pass your needle back through the rest of your seed beads. Pull the thread tight and position the beads close to the jump ring on the right side of the jump ring. Pass your needle through the jump ring from the right side. Then add another 2 inch length of beads to this side. 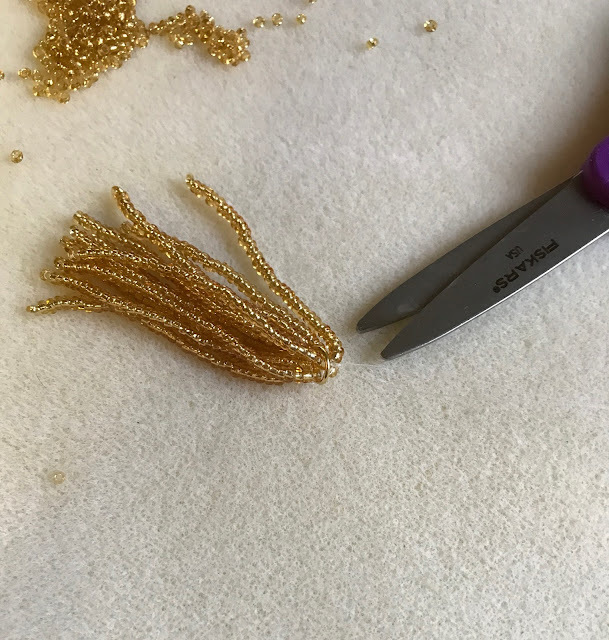 Skip the last bead and then pass the needle back through all of the seed beads on the left side as well. Tighten the thread and bring the seed beads close to the jump ring. 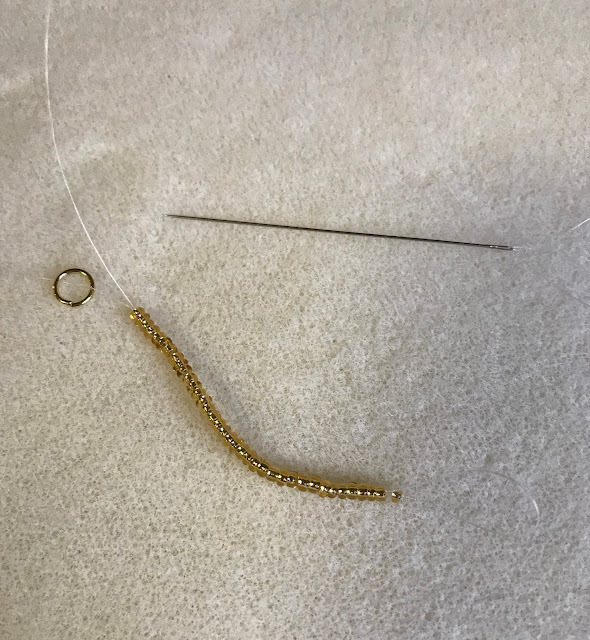 Pass your needle from the left side of the jump ring through to the right side and then continue adding on beads and repeating this process to make several different strands of beads alternating sides. 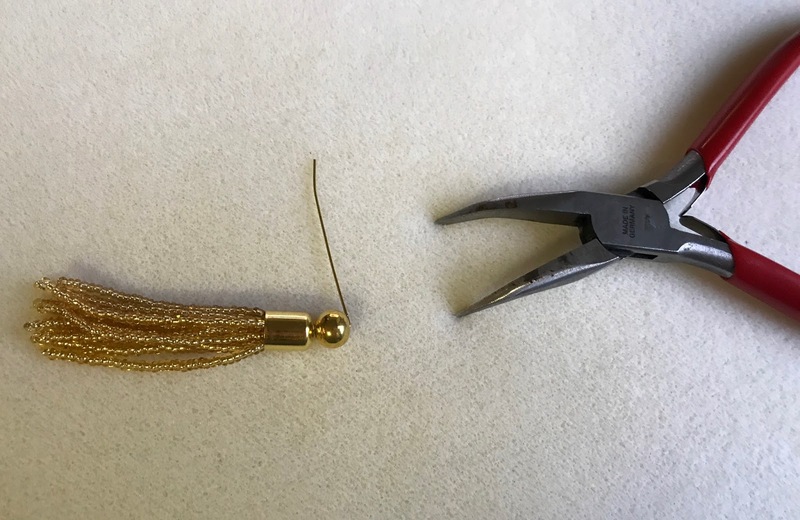 When you have made a tassel to the fullness that you desire (I did about 11 strands total) pass your needle back through the jump ring and tie a knot on one of the top beads of one of the strands on that same side. Then take off your needle and tie a few knots with the original tail and the thread you had been working with. 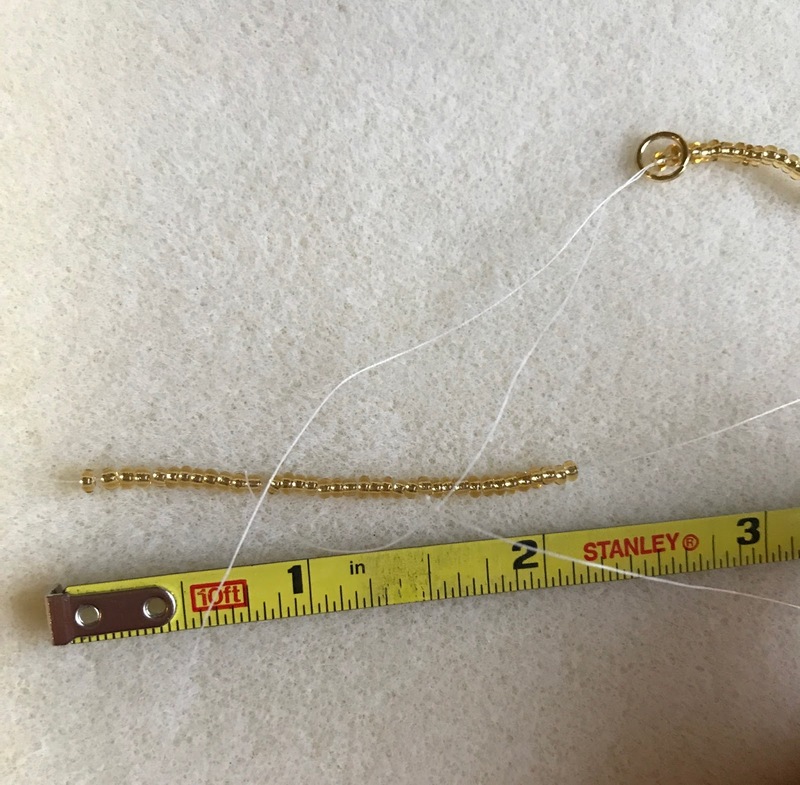 Use needle nose pliers to open up an eye pin and attach it to the top of the jump ring. Add on a bead cap and then a round gold bead. Slide everything down to sit on top of the tassel bead and then bend the eye pin 90 degrees directly above the gold bead using needle nose pliers. 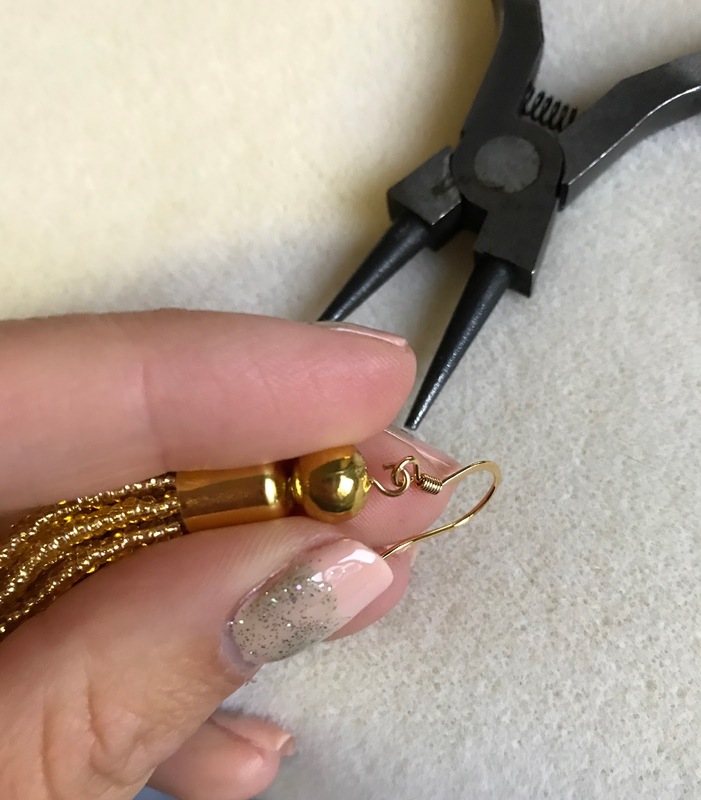 Use needle nose pliers to close up the loop and then your earring is done. 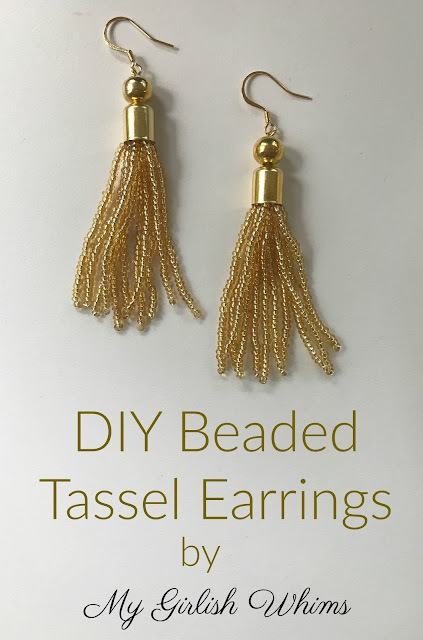 Repeat the process to make another earring and you have yourself an adorable pair of beaded tassel earrings! I love how these earrings turned out: I stuck to a monochromatic gold color for this first set but you could really change up the design using any color seed beads or focal beads above the tassels! 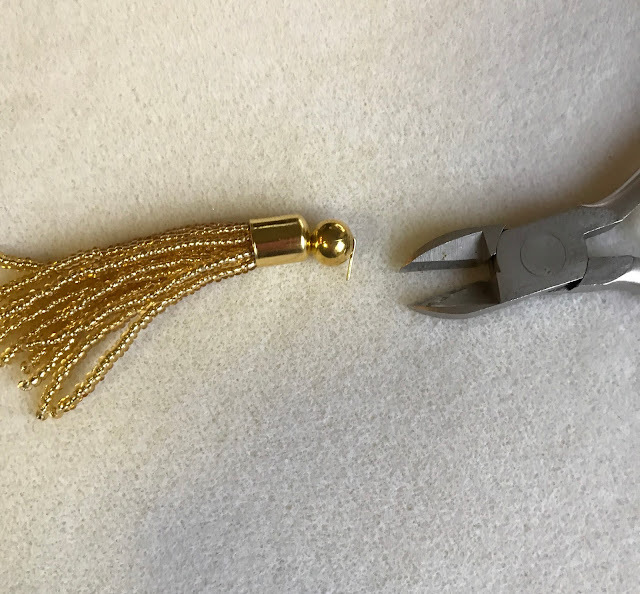 Since it's Labor Day and I have the day off I'm thinking of starting another pair using some pearl components on top of the tassel. Or....I might just end up laying by the pool and reading all afternoon since it's supposed to be nice and sunny today unlike my beach weekend. Hah! Either way, I hope you all enjoy this "last horrah" of summer holiday weekend and are able to spend some time relaxing and doing what you enjoy, beading, cooking, or just kicking back with some family and friends! These earrings are really awesome. Theses simple pair of earnings can dazzle your face more brightly. To see more collection of earrings, visit our online jewellery shop. 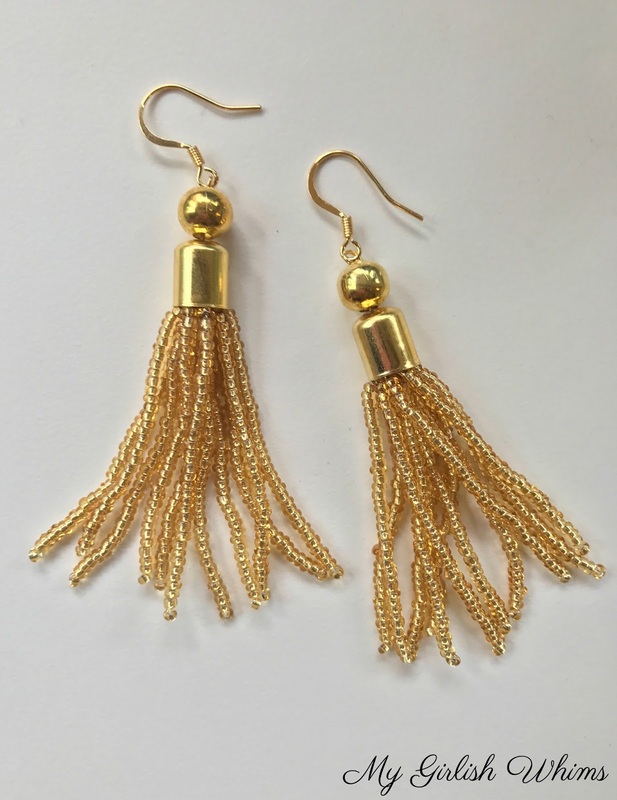 Artificial earrings online shopping is simple and safe.